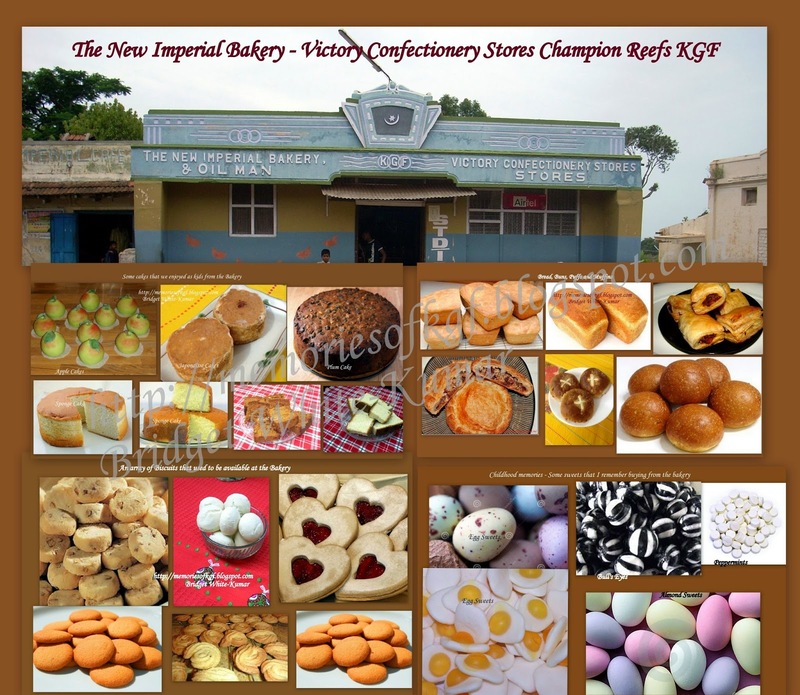 The ‘New Imperial Bakery and Oilman – Victory Confectionery Stores ’ in Champion Reefs, Kolar Gold Fields, (established during the early 1940s) was just opposite the KGF Mining Hospital. This Store was every child’s delight. Its shelves were lined with huge glass bottles filled with different kinds of sweets, biscuits, toffees, stick jaws, buns, curry puffs, etc. The Egg Sweets, ‘Wording sweets’, lollipops, Jujips, Almond Sweets, etc were all so delicious and enticing. It was so exciting choosing what sweets to buy. The Eggs sweets were the size of Turkey’s Eggs and the insides were a beautiful yellow just like a real egg. The almond sweets had huge almonds in them and the wording sweets and Bulls Eyes were minty and strong. Since it was just opposite the hospital, no hospital visit was complete without visiting this delightful place. Parents often had to bribe their kids to take their medicines with promises of goodies from the New Imperial Bakery. Besides these exciting sweets in their large glass bottles, the trays of Mutton and Vegetable Puffs, Buns, biscuits, cookies and other savouries was a gourmet's delight. We would visit this store whenever we went to the Mining Hospital or to Our Lady of Victories Church in Champion Reefs. 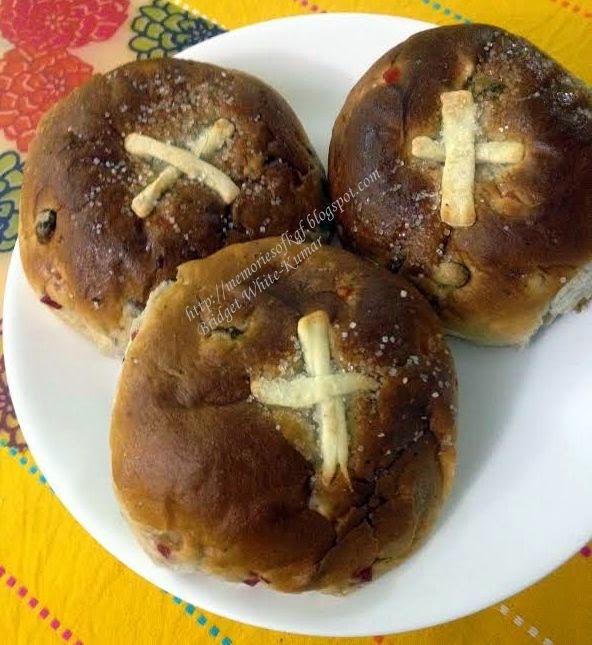 Our daily bread was also ‘home delivered’ every day at 4 o’clock in the evening. The ‘Bread Man’ brought the freshly baked loaves in a large Wooden Box tied on the carrier of his bicycle. This bread was delivered from the ‘New Imperial Bakery and Stores’ in Champion Reefs. The loaves of bread were always still hot from the oven when he brought them. These loaves were sold whole not sliced and just before dinner every night mummy would slice the loaf and leave it on the table for us. Like the mincing machine, each Anglo-Indian family had their own bread board and bread knife to slice the bread. The payment for the bread that was delivered every day was done on a monthly basis. Every house had their own page in the ‘Bread Man’s’ long account book, and entries would be made as to the number of loaves of bread and buns bought by them against the date. During the first week of the succeeding month, the representative of the ‘New Imperial Bakery and Stores’ would make the rounds for receiving payment of the bread delivered during the month. I really enjoy your blogs.Good to know that you are taking pains in ensuring that people all over the world read about this once-upon-a-time great place.It is a pity that today it resembles a ghost town.My in-laws live just opposite the bakery near the school.Whenever I visit KGF,I go there.His masala buns and biscuits are something to cherish.